"Like" token, awarded by Kghbln. "Like" token, awarded by Reception123. "Like" token, awarded by Jdlrobson. "Mountain of Wealth" token, awarded by Qgil. This is due to the limited space available in the menu (it was not designed as a dumping ground for links) and the fact that links are more complex than they are in Vector e.g. they feature an icon/are more limited in how they can be laid out. I'd suggest we add the config variable and use the hook to insert Nearby and update the Watchlist query string parameter to wrap this up. • Jdlrobson removed phuedx as the assignee of this task. • Jdlrobson added a subscriber: TPSuhr. 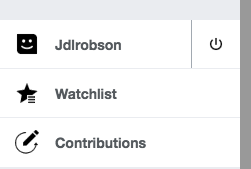 • Jdlrobson added a project: Technical-Debt. • Jdlrobson raised the priority of this task from Low to Normal. • Jdlrobson added subscribers: MtMNC, Nirzar, Issimo_15. Given the amount of interest in this... I'd really like us to give this some attention. This is by far the most requested thing from third parties..
@ovasileva what do you think? Can we work on this soon? I think it's a good feature to have. This feature might be interesting for Wikimedia projects as well. For 1, 2, and 4, the MobileMenu hook is run with a MenuBuilder instance that you can manipulate-ish that part of the menu. I'm all for extending/superseding the current system with something more flexible and admin/developer friendly. Just remember that there's a hook that may need to be deprecated! I think the problem is that for most using a hook is a bit overkill. Most 3rd parties want to people to edit an interface menu page or copy and paste something to LocalSettings. The menu in other skins is configured via a mediawiki message (the logic is pretty complicated - check out SkinTemplate::buildContentNavigationUrls and/or https://www.mediawiki.org/wiki/Manual:Interface/Sidebar. The problem with this approach for mobile is it is very limiting - it doesn't take into account icons for example or EventLogging and where text for items in a menu may be different from the page title (for example in mobile because of limited space we show a logout icon with no text). It also assumes all skins will have exactly the same menu, which is not practical for mobile - if you have a separate mobile experience it makes sense that the menu may be different. I think at the very least we should strive to define the menu as a config option. I'd rather not go down the message route, given it is wikitext there is far more that could go wrong. If we can derive icon values from keys/page titles, even better. Just curious: what is the problem of offering the same approach as MediaWiki:Sidebar, just for mobile? In case that wasn't clear, my worry with the interface sidebar approach is that it is more complicated. If we were to do that, I'd suggest we add tests and refactor the code in core beforehand. We could then add a MediaWiki:Mobile sidebar page that reused the logic and extended it to support the additional properties of our mobile menus. Adding a config variable to control this would be considerably less work. This! When you click the "hamburger" it pulls up the menu in a slide-out screen anyway, so why not make it as flexible and configurable for the end user as MediaWiki:Sidebar ? From a technical perspective, I doubt there are any blockers. I'd like to hear from @Nirzar/Design. What I meant was that this page and https://www.mediawiki.org/wiki/Extension_talk:MobileFrontend keeps referring to PHP files like LocalSettings that I can't modify anyway. On Swedish Wikipedia (sv.wikipedia) there is a huge amount of bot created articles. The main criticism against these articles (at least from readers) is that Special:Slumpsida (Special:Random) in the sidebar is useless because 9/10 articles are created by bots. So, User:Prolineserver created a tool on tools.wmflabs that excludes bot created articles, and we have a link to that next to Special:Random. https://sv.wikipedia.org/wiki/MediaWiki:Gadget-ExkluderaRobotskapadeSidor.js does that nicely for the desktop version, and https://sv.wikipedia.org/wiki/MediaWiki:Gadget-ExkluderaRobotskapadeSidorMobil.js attempted to do the same for the mobile version, but I've removed it. The important detail here is that I need to be able to add the link on the same line, so any PHP solution is unlikely to be sufficient anyway. Is there a reason not to add a mw.hook when the sidebar is done? It's one line of code, right? Thanks for sharing the use case! Side note: Is there an argument to be made that the exclude bot link should be default on mobile where the majority of users are readers (due to the difficulty of mobile editing)? Still relevant, but mostly of use to third parties which is why there's been little movement here. • Jdlrobson added subscribers: Vapblack, Jhernandez. Reception123 added a subscriber: Reception123. Reception123 removed a subscriber: Reception123. • Jdlrobson merged a task: T189437: Allow editing links to other languages in mobile view. • Jdlrobson added a project: Readers-Web-Backlog (Design). • Jdlrobson added a subscriber: Capankajsmilyo. Kghbln added a subscriber: Kghbln. I recommend looking into what BlueSky does, both for icons and customisability. Essentially you probably want to create a second navigation interface message structured like the sidebar with an extra |item for icon specifying, with a parser that functions similarly to a simplified version of the sidebar parser that outputs a standard portlet/set of portlets. This approach allows for onwiki customisation both for the rendered html (editing the mediawiki namespace interface message) and js overrides using the standard addportletlink etc functions, which work with pretty much anything following the expected structure. ...may also want to add a config variable so third party sites can just throw in their sidebar instead of having an entirely separate menu. • Jdlrobson added a parent task: T198313: [GOAL] Advanced mobile contributions.